TORONTO/TA’ XBIEX (March 26, 2019) – Today, Betsson Group, a global leader in online gambling, officially announced its partnership with Ada, the market leader in automated customer experience (ACX). 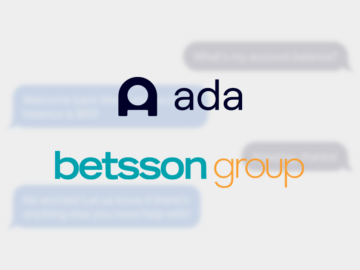 Using Ada’s AI-powered platform, Betsson Group has built and launched three chatbots that speak eight languages to provide its 600,000+ active customers with 24/7 engagement across the brand’s top websites including Betsson, Betsafe and NordicBet. This investment in automation reflects Betsson’s commitment to strengthening its award-winning customer experience through digital transformation for customer convenience, while empowering its service agents to take on more complex inquiries that drive customer value. By introducing Ada as a key component of its customer service offering, the partnership allows Betsson Group to elevate their quality of self-serve support by providing always-on, instant support that reduces customer time and effort to get the information and answers they need, anytime they need it. The partnership is a landmark implementation for Ada as well. “Betsson Group is consistently honoured with top industry awards that recognize its commitment to driving customer service excellence,” said Mike Murchison, CEO of Ada. “We are proud to work with Betsson to ensure the automated experience matches and enhances the high-quality, award-winning support their customers have come to expect.” Betsson Group has won several prestigious awards within the industry including ‘Customer Service Operator of the Year’ for the fourth consecutive year at the EGR Nordic Awards 2019, and the ‘Socially Responsible Operator of the Year’ at the International Gaming Awards 2019. Betsson AB The parent company is Betsson AB, read more.."